We really enjoyed our first visit to the White Eagle. Joining us for the evening, from Seattle, was “The Senate”, who performed an energetic and entertaining set of music, including everything from acoustic beatboxing, to a cover of Def Leppard’s “Pour Some Sugar on Me”. For our part, we mixed in a little old and new, debuting our first “Keep Your Halls Well Lit” and “UHF". UHF was also significant for being our first drum loop-based jam. Overall, we kept things loose and mellow, with a number of jammy nuggets as the set developed. 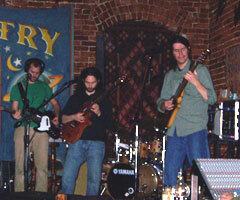 We look forward to being back at the White Eagle in January 2008. I sure did enjoy my first public Mood Doculations! It's been a long time coming and I can't wait to be in attendance at the upcoming shows! See you all very soon!